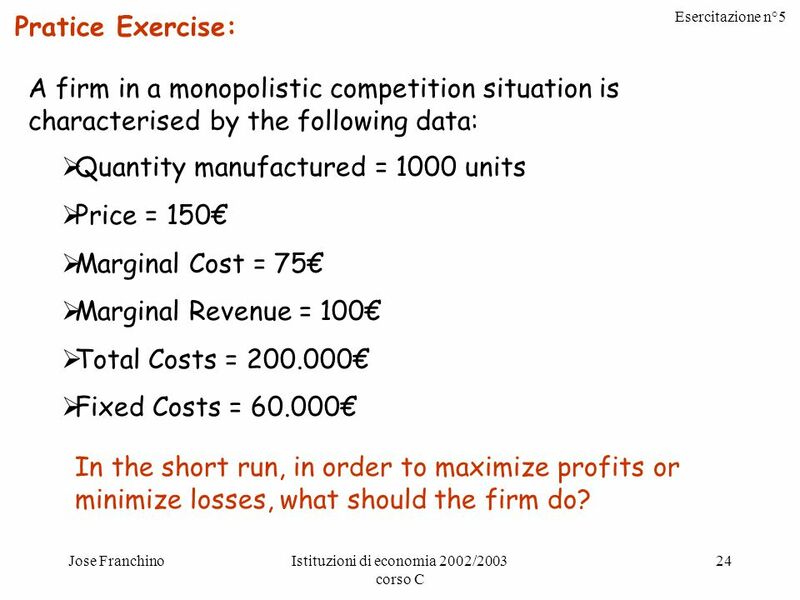 Esercitazione n°5 Jose FranchinoIstituzioni di economia 2002/2003 corso C 1 Chapters: 16 – Oligopoly 17 – Monopolistic Competition Exercises. 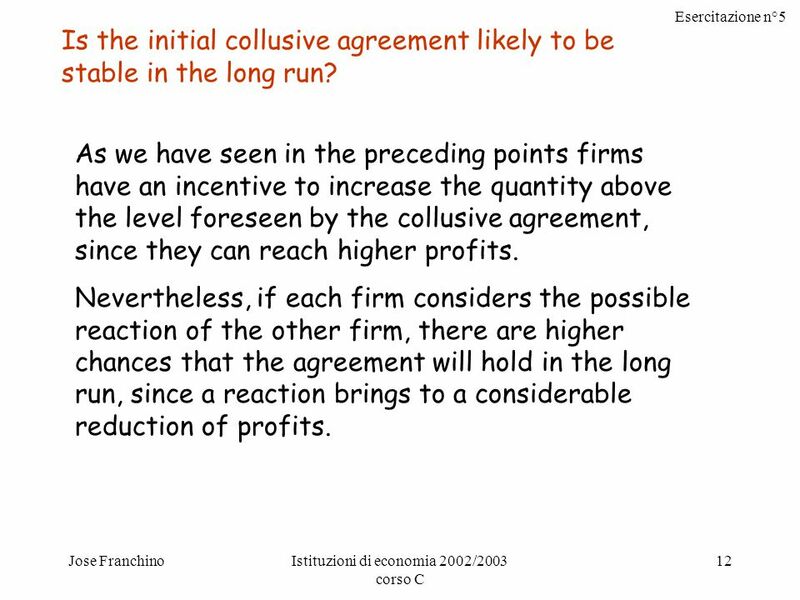 12 Esercitazione n°5 Jose FranchinoIstituzioni di economia 2002/2003 corso C 12 Is the initial collusive agreement likely to be stable in the long run? 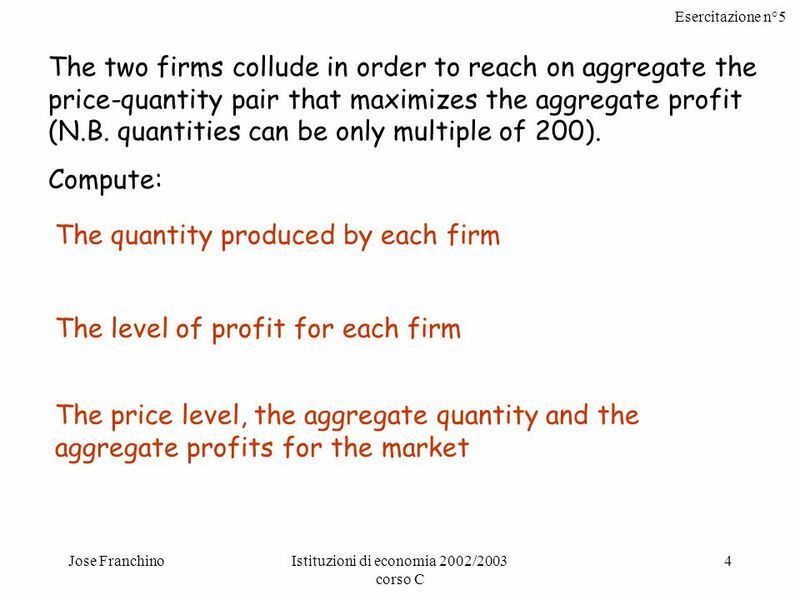 As we have seen in the preceding points firms have an incentive to increase the quantity above the level foreseen by the collusive agreement, since they can reach higher profits. Nevertheless, if each firm considers the possible reaction of the other firm, there are higher chances that the agreement will hold in the long run, since a reaction brings to a considerable reduction of profits. 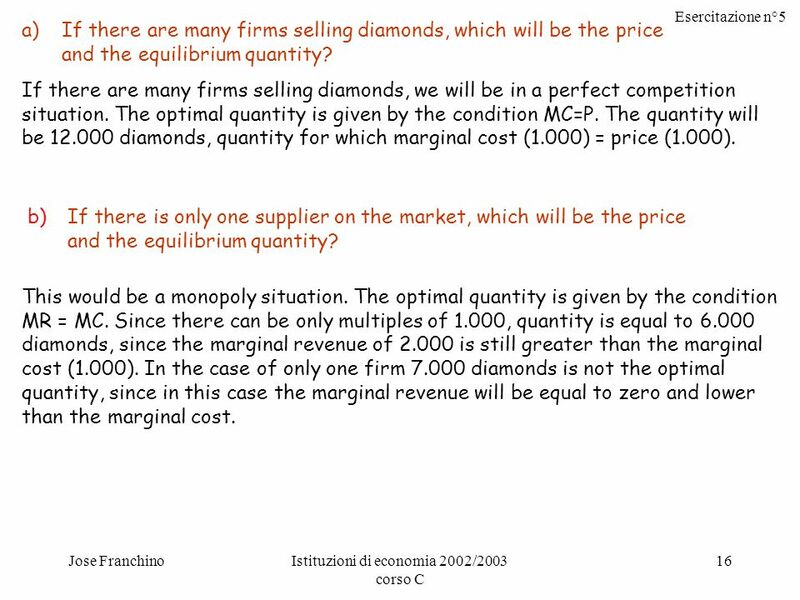 14 Esercitazione n°5 Jose FranchinoIstituzioni di economia 2002/2003 corso C 14 a)If there are many firms selling diamonds, which will be the price and the equilibrium quantity? 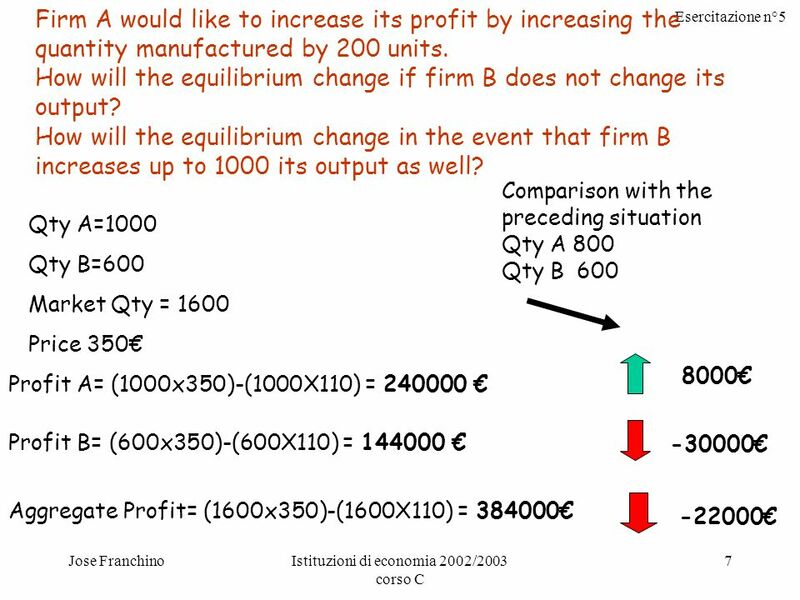 b)If there is only one supplier on the market, which will be the price and the equilibrium quantity? 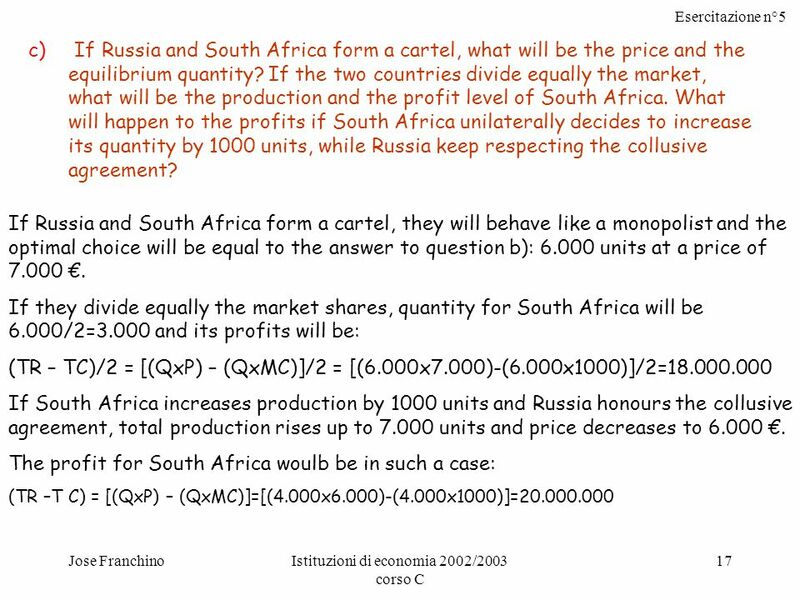 c)If Russia and South Africa form a cartel, what will be the price and the equilibrium quantity? If the two countries divide equally the market, what will be the production and the profit level of South Africa. What will happen to the profits if South Africa unilaterally decides to increase its quantity by 1000 units, while Russia keep respecting the collusive agreement? 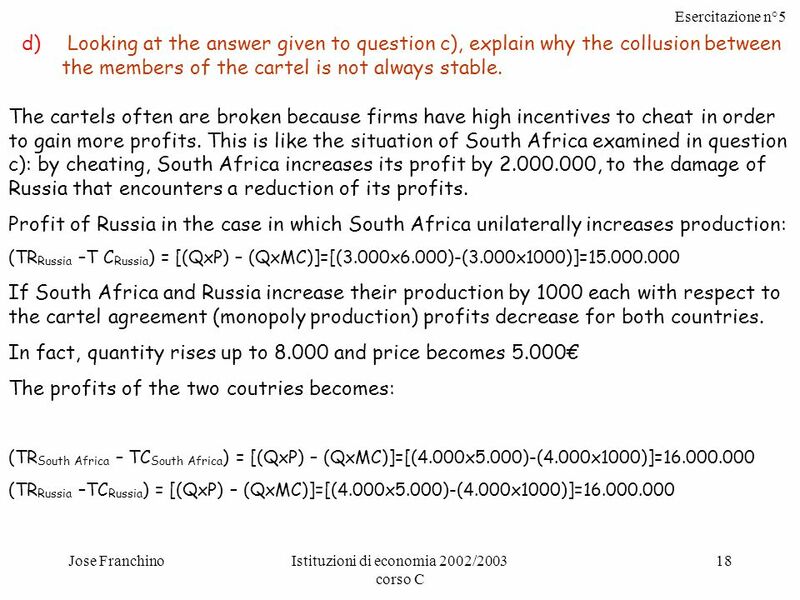 d)Looking at the answer given to question c), explain why the collusion between the members of the cartel is not always stable. 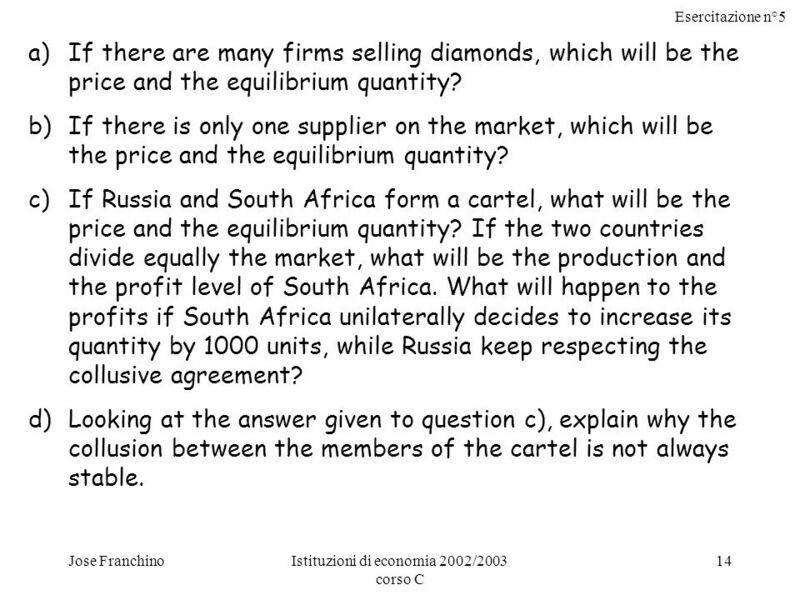 16 Esercitazione n°5 Jose FranchinoIstituzioni di economia 2002/2003 corso C 16 a)If there are many firms selling diamonds, which will be the price and the equilibrium quantity? If there are many firms selling diamonds, we will be in a perfect competition situation. The optimal quantity is given by the condition MC=P. The quantity will be 12.000 diamonds, quantity for which marginal cost (1.000) = price (1.000). 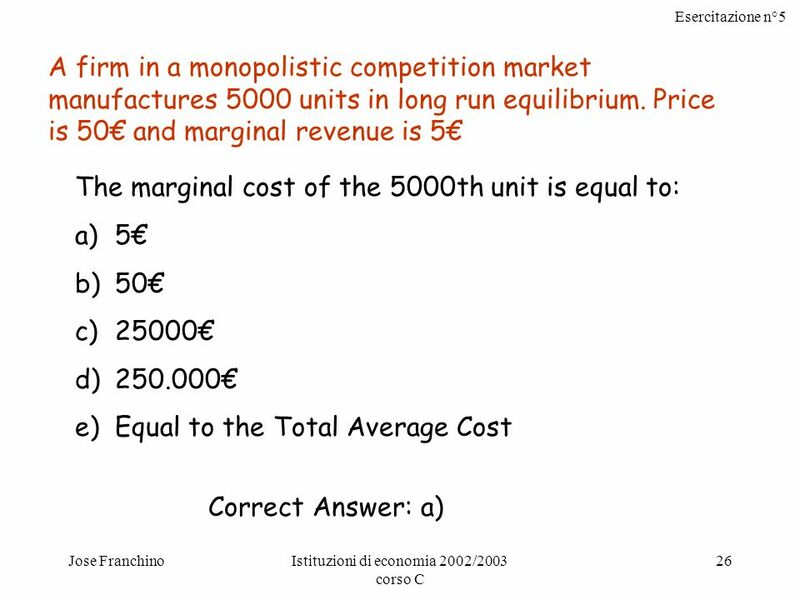 b)If there is only one supplier on the market, which will be the price and the equilibrium quantity? This would be a monopoly situation. The optimal quantity is given by the condition MR = MC. Since there can be only multiples of 1.000, quantity is equal to 6.000 diamonds, since the marginal revenue of 2.000 is still greater than the marginal cost (1.000). 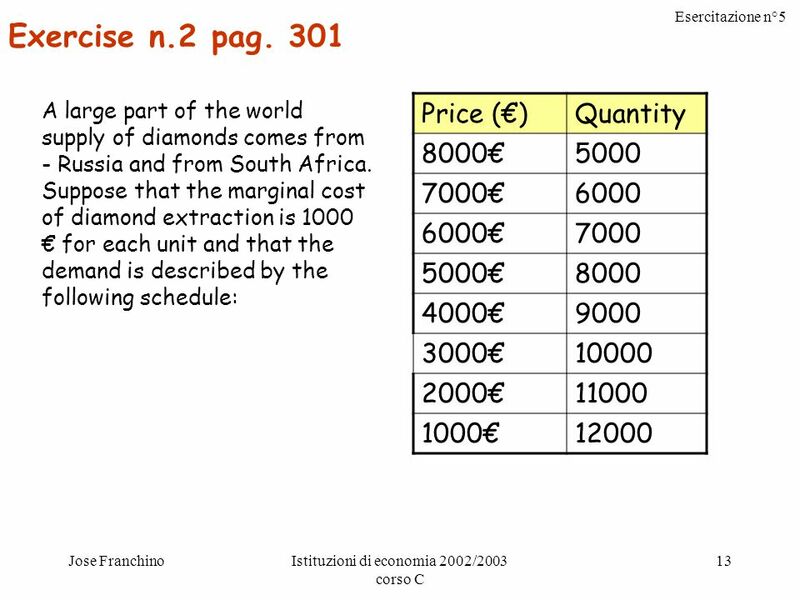 In the case of only one firm 7.000 diamonds is not the optimal quantity, since in this case the marginal revenue will be equal to zero and lower than the marginal cost. 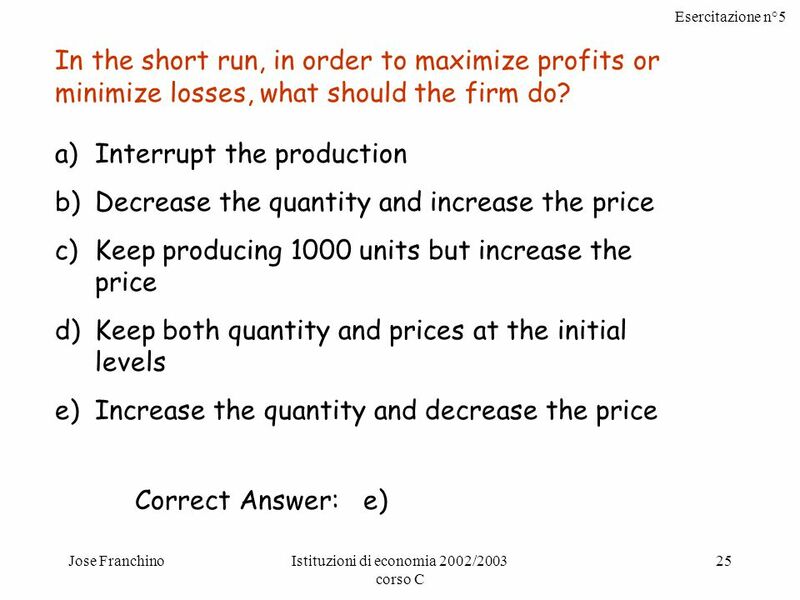 20 Esercitazione n°5 Jose FranchinoIstituzioni di economia 2002/2003 corso C 20 a)Which is the dominant strategy for US? And for Mexico? b)Define a Nash equilibrium. 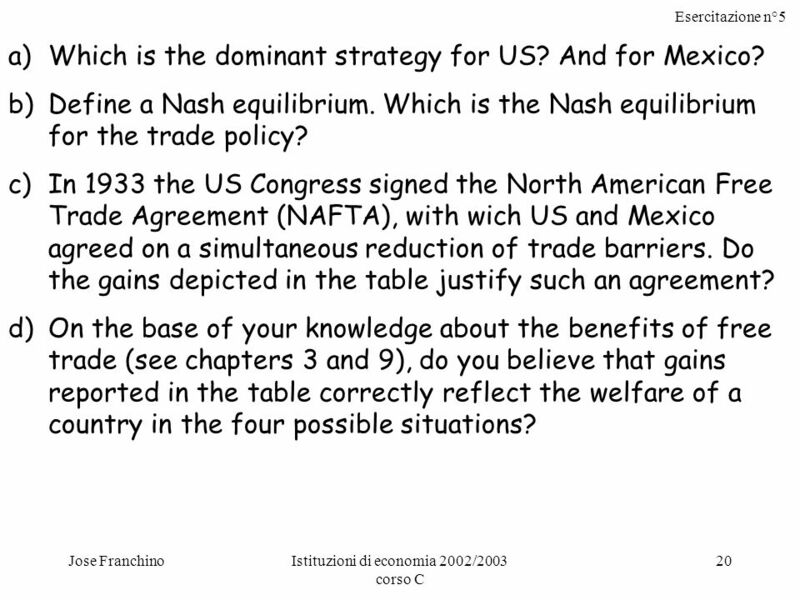 Which is the Nash equilibrium for the trade policy? c)In 1933 the US Congress signed the North American Free Trade Agreement (NAFTA), with wich US and Mexico agreed on a simultaneous reduction of trade barriers. Do the gains depicted in the table justify such an agreement? 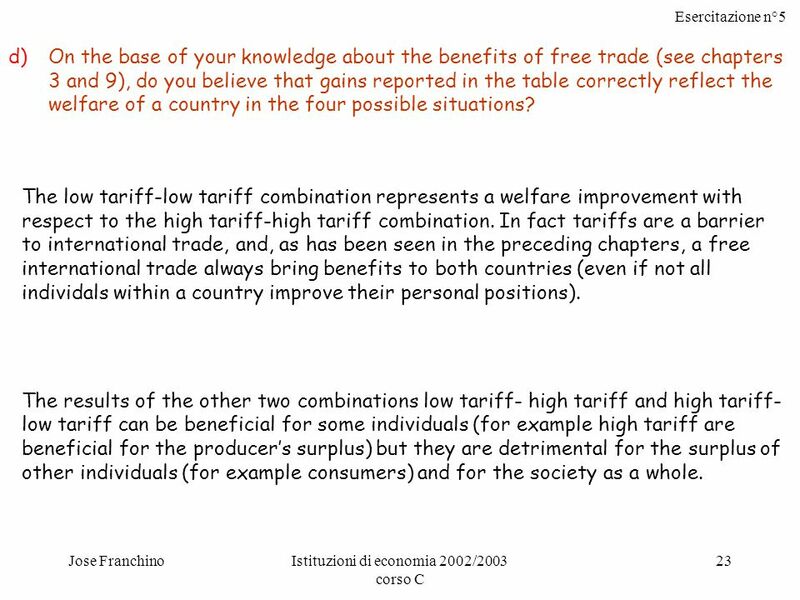 d)On the base of your knowledge about the benefits of free trade (see chapters 3 and 9), do you believe that gains reported in the table correctly reflect the welfare of a country in the four possible situations? 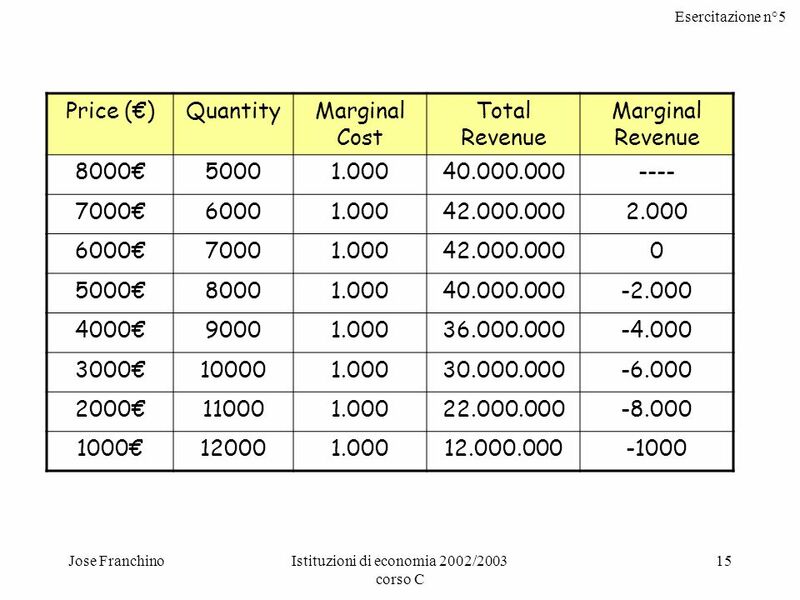 21 Esercitazione n°5 Jose FranchinoIstituzioni di economia 2002/2003 corso C 21 a)Which is the dominant strategy for US? And for Mexico? From the point of view of the US If Mexico chooses low tariffs, the US should fix high tariffs, since they gain 30 instead of 25 (with a low tariff). If Mexico chooses high tariffs, the US should fix high tariffs, since they gain 20 billion instead of 10 (with a low tariff). Whatever the choice of Mexico, the US have a best strategy: the imposition of a high tariff. This is a dominant strategy for the US. From the point of view of Mexico If the US choose low tariffs, Mexico should fix high tariffs, since it gains 30 instead of 25 (with a low tariff). If the US choose high tariffs, Mexico should fix high tariffs, since it gains 20 billion instead of 10 (with a low tariff). Whatever the choice of the US, Mexico has a best strategy: the imposition of a high tariff. This is a dominant strategy for Mexico. 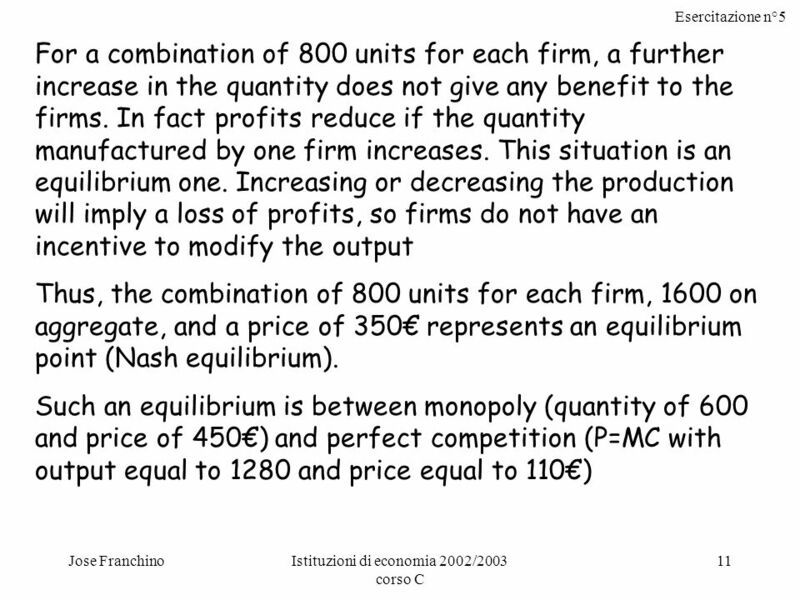 22 Esercitazione n°5 Jose FranchinoIstituzioni di economia 2002/2003 corso C 22 b)Define a Nash equilibrium. 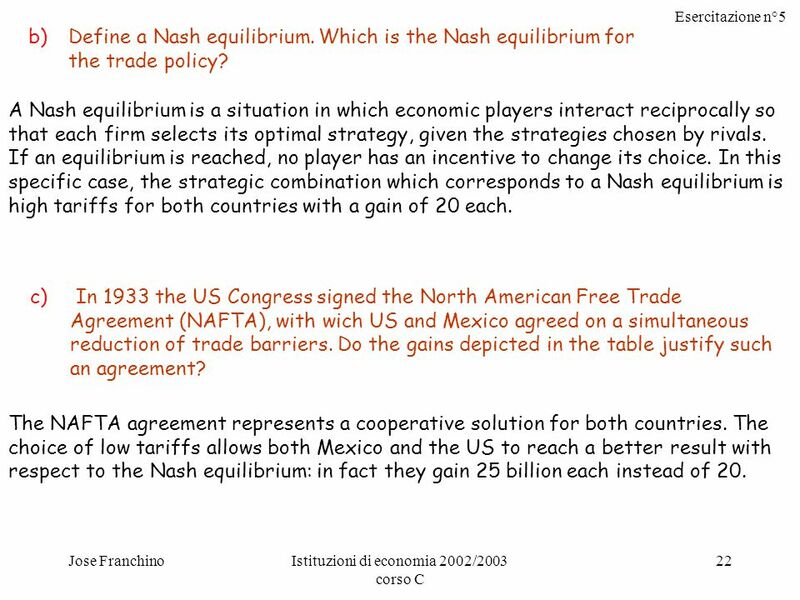 Which is the Nash equilibrium for the trade policy? A Nash equilibrium is a situation in which economic players interact reciprocally so that each firm selects its optimal strategy, given the strategies chosen by rivals. If an equilibrium is reached, no player has an incentive to change its choice. 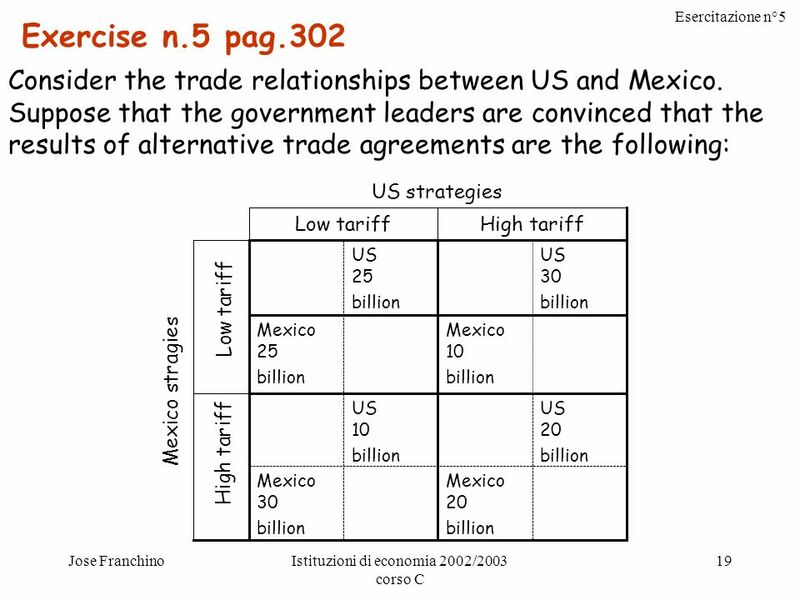 In this specific case, the strategic combination which corresponds to a Nash equilibrium is high tariffs for both countries with a gain of 20 each. c) In 1933 the US Congress signed the North American Free Trade Agreement (NAFTA), with wich US and Mexico agreed on a simultaneous reduction of trade barriers. Do the gains depicted in the table justify such an agreement? The NAFTA agreement represents a cooperative solution for both countries. 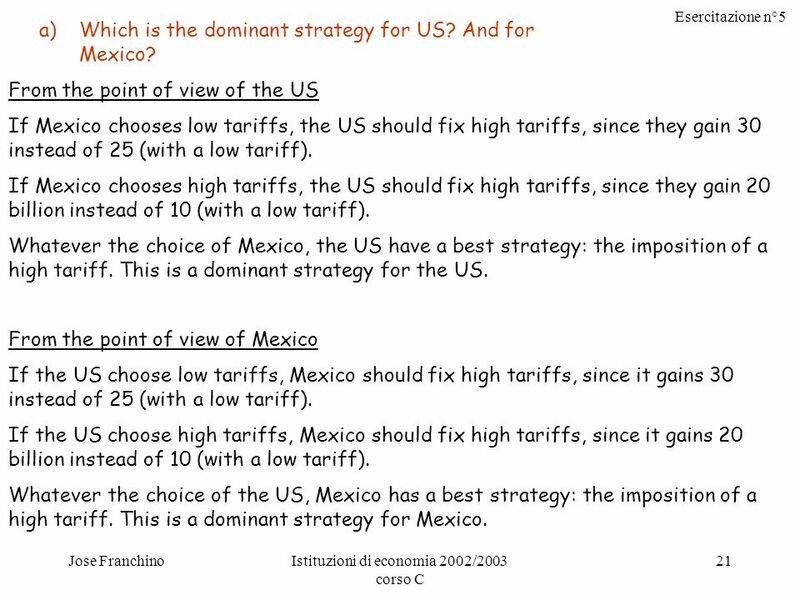 The choice of low tariffs allows both Mexico and the US to reach a better result with respect to the Nash equilibrium: in fact they gain 25 billion each instead of 20. 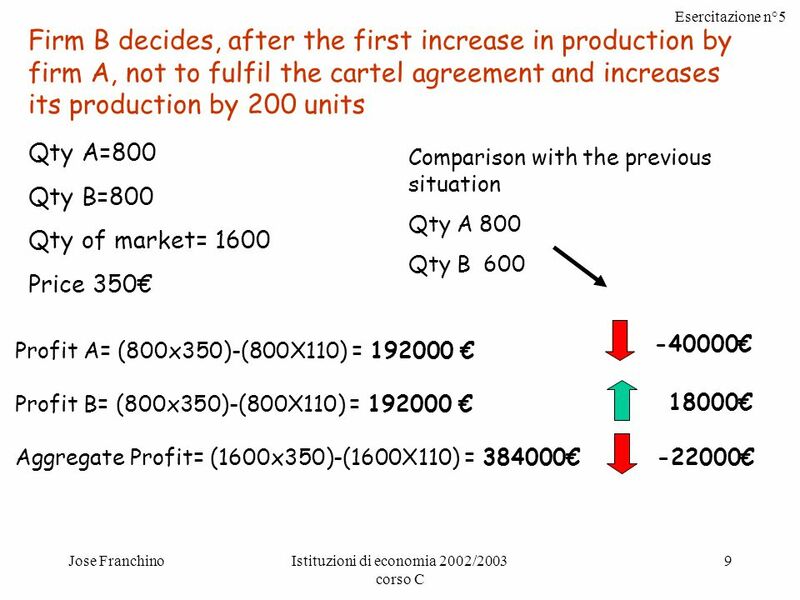 23 Esercitazione n°5 Jose FranchinoIstituzioni di economia 2002/2003 corso C 23 d)On the base of your knowledge about the benefits of free trade (see chapters 3 and 9), do you believe that gains reported in the table correctly reflect the welfare of a country in the four possible situations? The low tariff-low tariff combination represents a welfare improvement with respect to the high tariff-high tariff combination. In fact tariffs are a barrier to international trade, and, as has been seen in the preceding chapters, a free international trade always bring benefits to both countries (even if not all individals within a country improve their personal positions). The results of the other two combinations low tariff- high tariff and high tariff- low tariff can be beneficial for some individuals (for example high tariff are beneficial for the producer’s surplus) but they are detrimental for the surplus of other individuals (for example consumers) and for the society as a whole. 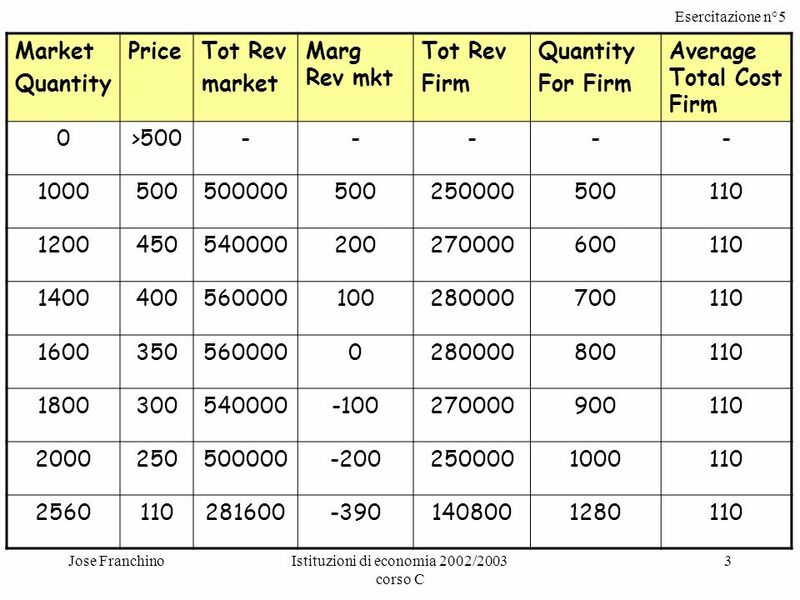 24 Esercitazione n°5 Jose FranchinoIstituzioni di economia 2002/2003 corso C 24 A firm in a monopolistic competition situation is characterised by the following data:  Quantity manufactured = 1000 units  Price = 150€  Marginal Cost = 75€  Marginal Revenue = 100€  Total Costs = 200.000€  Fixed Costs = 60.000€ Pratice Exercise: In the short run, in order to maximize profits or minimize losses, what should the firm do? 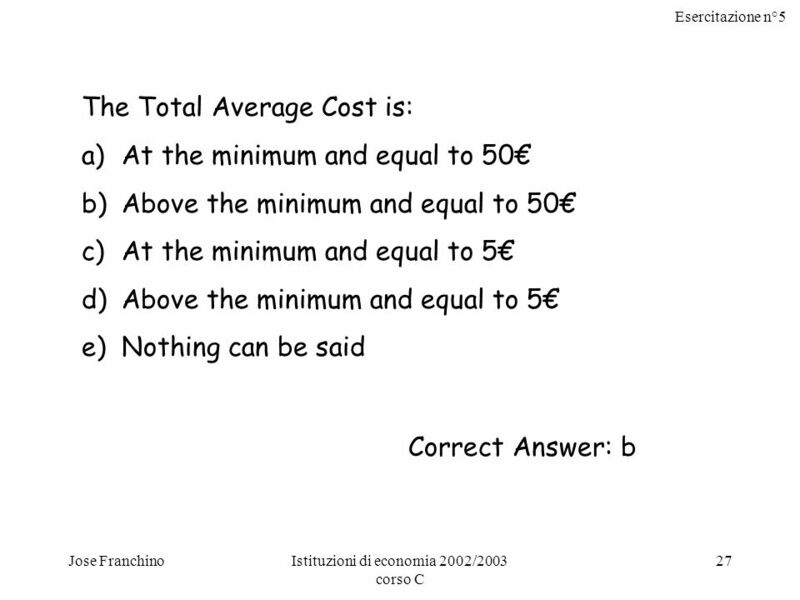 28 Esercitazione n°5 Jose FranchinoIstituzioni di economia 2002/2003 corso C 28 Problem n.4 pag. 316 Scintilla is one of the large number of firms active in the toothpaste industry and is in a long run equilibrium situation. 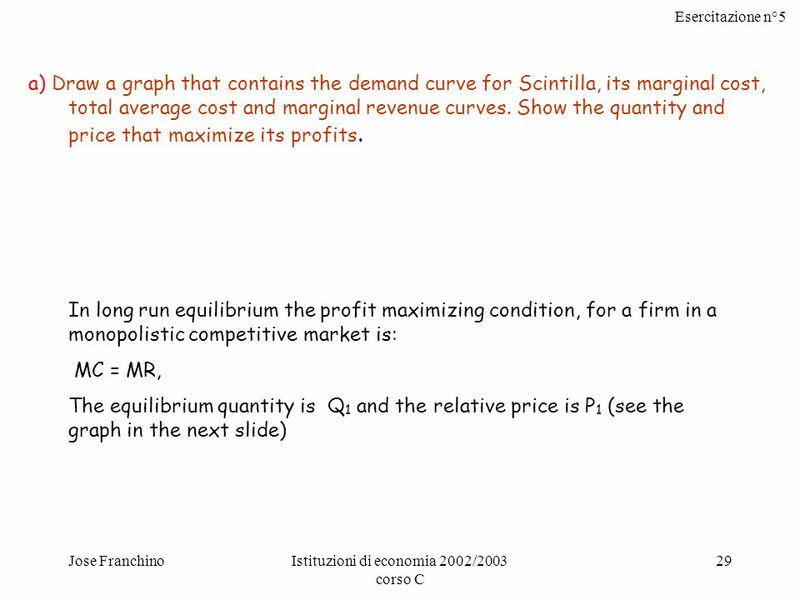 a)Draw a graph that contains the demand curve for Scintilla, its marginal cost, total average cost and marginal revenue curves. Show the quantity and price that maximize its profits. 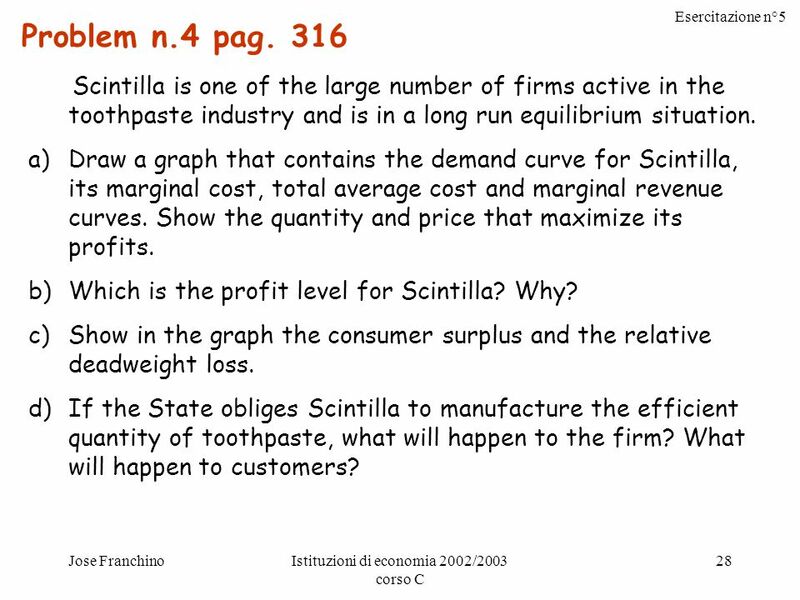 b)Which is the profit level for Scintilla? Why? c)Show in the graph the consumer surplus and the relative deadweight loss. 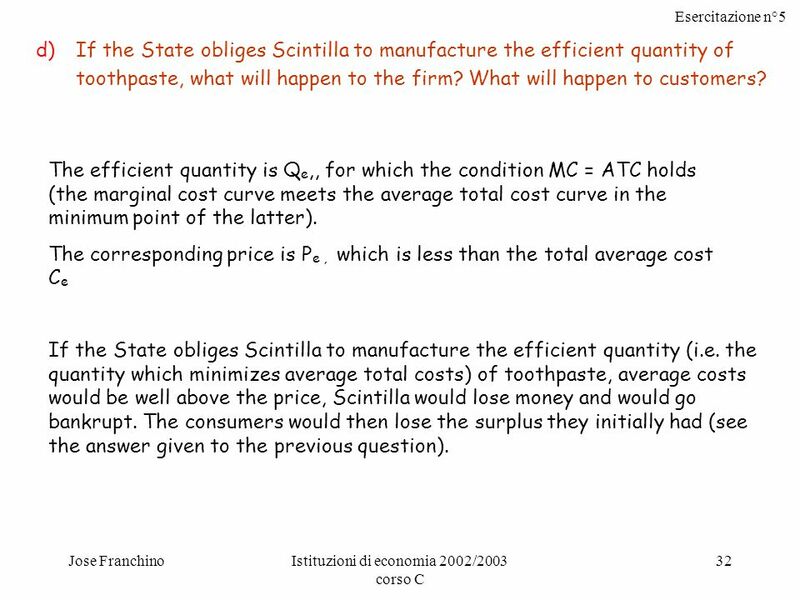 d)If the State obliges Scintilla to manufacture the efficient quantity of toothpaste, what will happen to the firm? What will happen to customers? 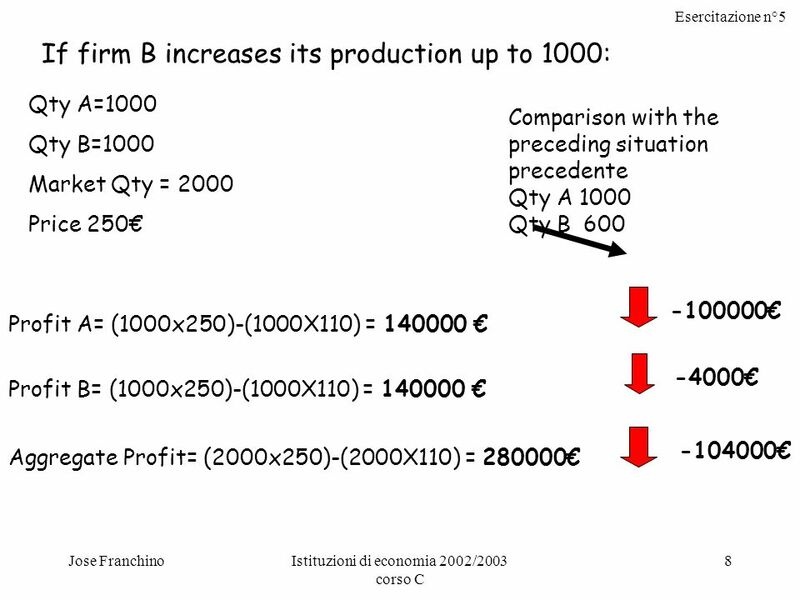 31 Esercitazione n°5 Jose FranchinoIstituzioni di economia 2002/2003 corso C 31 a)Which is the profit level for Scintilla? Why? 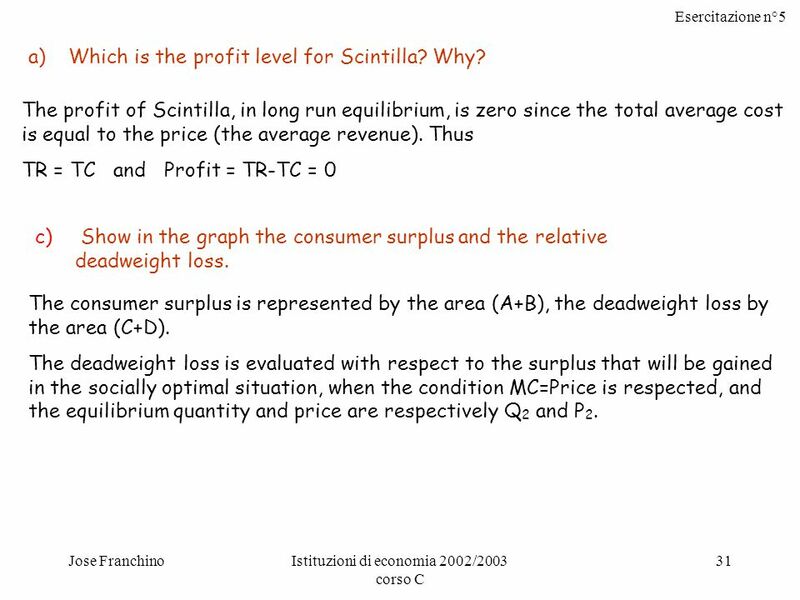 The profit of Scintilla, in long run equilibrium, is zero since the total average cost is equal to the price (the average revenue). Thus TR = TC and Profit = TR-TC = 0 c) Show in the graph the consumer surplus and the relative deadweight loss. The consumer surplus is represented by the area (A+B), the deadweight loss by the area (C+D). 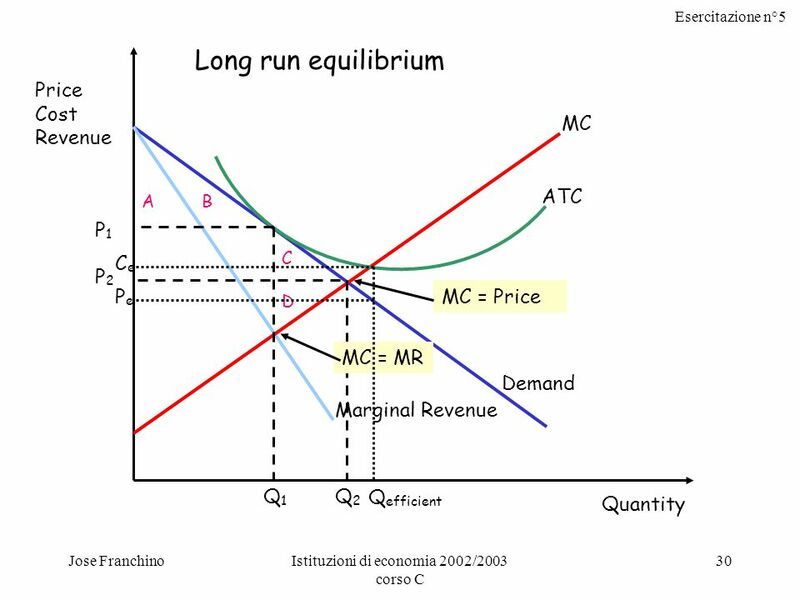 The deadweight loss is evaluated with respect to the surplus that will be gained in the socially optimal situation, when the condition MC=Price is respected, and the equilibrium quantity and price are respectively Q 2 and P 2. 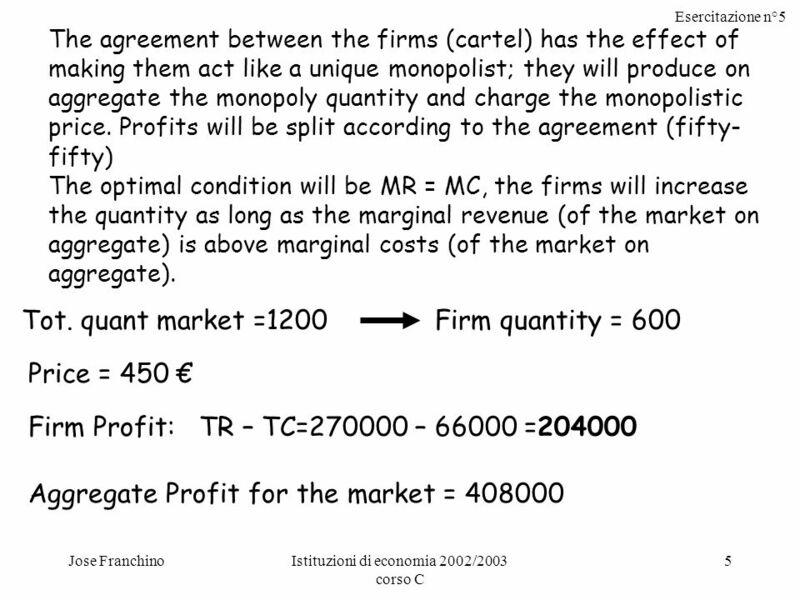 Download ppt "Esercitazione n°5 Jose FranchinoIstituzioni di economia 2002/2003 corso C 1 Chapters: 16 – Oligopoly 17 – Monopolistic Competition Exercises." Copyright © 2008 Pearson Addison-Wesley. All rights reserved. 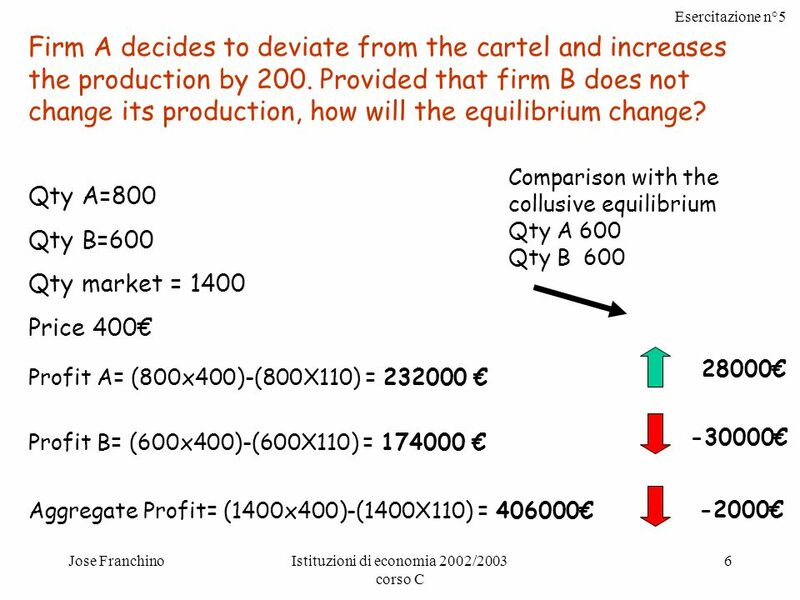 Chapter 10 Monopoly, Cartels, and Price Discrimination. Chapter Twenty-Seven Oligopoly. u A monopoly is an industry consisting a single firm. u A duopoly is an industry consisting of two firms. u An oligopoly. MICROECONOMICS EV Prof. Davide Vannoni. Exercise session 4 monopoly and deadweight loss 1.Exercise on monopoly and deadweight loss 2.Exercise on natural. 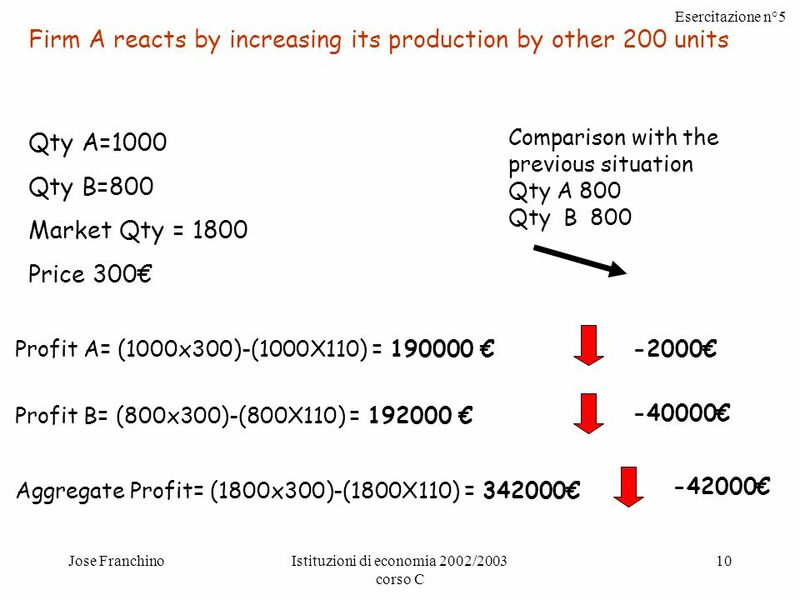 Esercitazione n.7 Jose FranchinoIstituzioni di economia 2002/2003 corso C 1 Chapter: 18 – The Markets for the Factors of Production Exercise n° 6. © 2005 Pearson Education Canada Inc Chapter 16 Game Theory and Oligopoly. 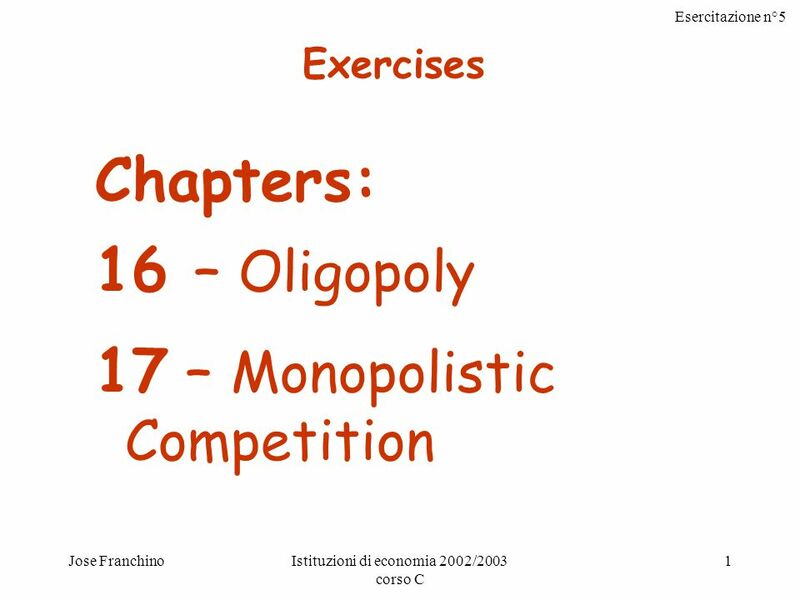 Chapter 12 Monopolistic Competition and Oligopoly. CHAPTER 9 Basic Oligopoly Models Copyright © 2014 McGraw-Hill Education. All rights reserved. No reproduction or distribution without the prior written. Ch. 16 Oligopoly. 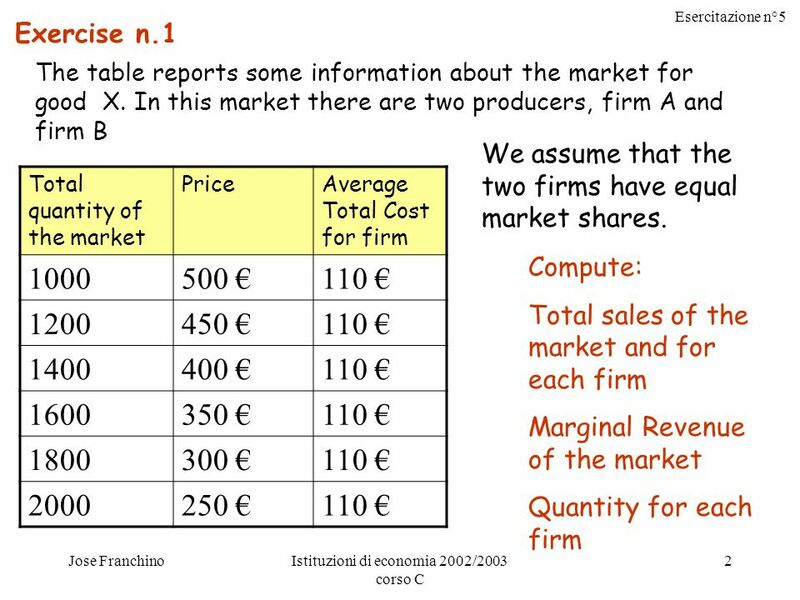 Oligopoly Only a few sellers offer similar or identical products Actions of any seller can have large impact on profits of other sellers.